Eventing grooms are, beyond a shadow of a doubt, some of the hardest-working people out there. For every six minute dressage test, or moment of glory over the final fence, there have been countless hours of conscientious care behind the scenes to ensure that the sport’s equine heroes are feeling and looking their absolute best. When the season wraps up and the horses’ shoes are pulled for a well-earned break, their #supergrooms finally get a chance to enjoy a much-needed rest (and an alarm that sounds later than 5 a.m. — what a concept!). But one top groom has chosen to spend her time off in a slightly different way this year. Meet 24-year-old Jess Wilson, head girl and travelling groom for the legendary Sir Mark Todd. It’s no small task looking after Mark’s formidable string of top-level talent, and she’s on the road almost constantly throughout the season fulfilling her duties as the lynchpin of the team. But her love for horses extends well beyond the four-star competitors she tends to. She’s on a mission to improve the lives of working equids in some of the most underserved communities in the world — and this winter, she’s bringing us with her. 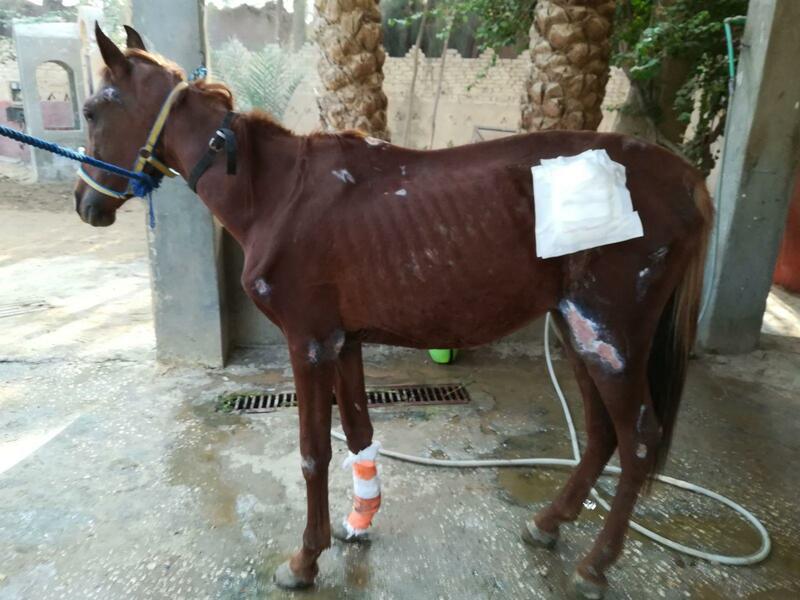 We’re so excited to have Jess on board the EN team, as she shares with us her experiences in Egypt and gives us a first-hand look at what Animal Care Egypt and Egypt Equine Aid are doing to help working horses, ponies and donkeys abroad. Fancy getting involved? Take a look at her JustGiving page, where she’s busy raising vital funds for both charities, and follow her on Instagram, too, for live updates from the field. If you missed them, check out part one, part two, part three, and part four of Jess’ blog. Unfortunately, my last afternoon in Luxor was spent in bed! Maybe the stress and emotion of this trip finally got the better of me, and after a few days of battling with a nasty stomach bug the daily stench of fermenting fodder when stomach-tubing colicy horses and the smell of puss from infected wounds became too much. I decided to try sleep my illness off so I would be able to function for the final week of my trip. Rest did the trick and I was feeling much better and able to fly to Cairo the next day where I was visiting a second charity — Egypt Equine Aid, or EEA. I was picked up from the airport by EEA’s founder Jill Barton, who is simply a remarkable lady with endless drive and determination to change the dire situation of horses in Cairo and its surrounding areas. Jill founded EEA in 2014, having seen a desperate need for medical help for the working horses in the area and has basically single-handedly developed the charity from the ground up. Now, it’s well-established and able to offer lifesaving care for over 60 patients. EEA is situated close to the Abu Sir pyramids on the outskirts of Giza — a place which, to me, summed up Egypt. On the same stretch of road I was driven past opulent Arabian stud farms behind elaborately decorated high walls — then, 25 metres further along, we’d see barefoot children gathered around the village tap, filling up dirty plastic containers with water. The extremes of everything here are immense! 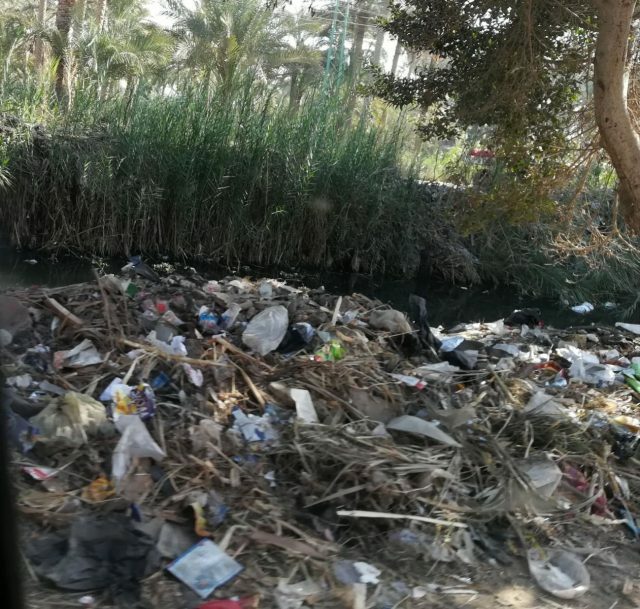 Rubbish in the streets, just metres from the opulence of Egypt’s richest citizens. 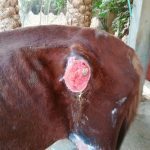 I was surprised to hear from Egyptian vets that veterinary careers are not very well-respected here at all, and require only mediocre grades in school and absolutely no practical experience. So not only is Jill serving a poor and uneducated population and fighting against the lack of animal welfare laws in Egypt, she’s also tackling the problem of massively incompetent and unregulated vets on the loose. EEA regularly has patients here suffering from problems caused by local vets making huge mistakes in their treatment or diagnosis. It’s frustrating when owners have tried to do the right thing by seeking help from a professional, rather than a traditional witch-doctor, only for the so-called professional to actually make the ailment worse! 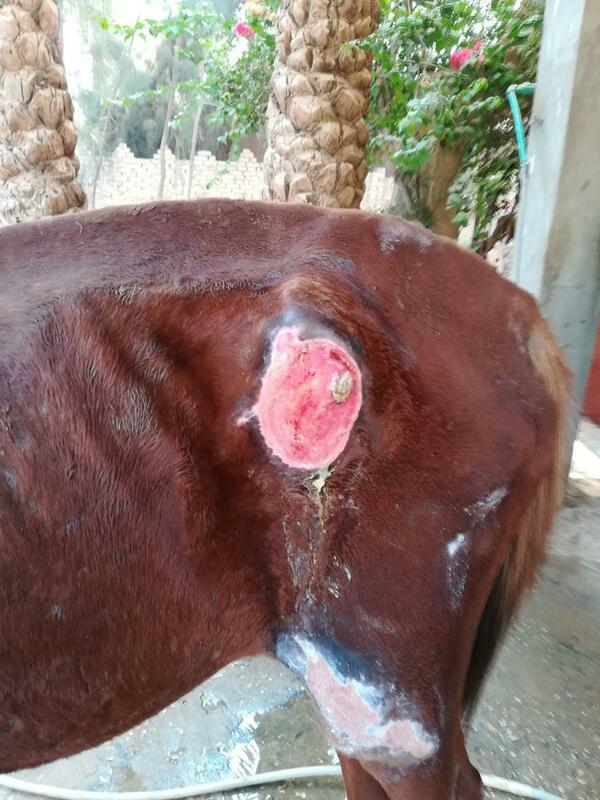 Enormous swellings like these are a common complaint of Cairo’s working horses — often, such as in this case, they’re caused by infections from the dirty needles used by some local vets. Photo courtesy of Egypt Equine Aid. Luckily for the horses of Giza, EEA has a knowledgeable and dedicated team, all closely supervised and managed by Jill, who has also started a 10-week training program for newly-qualified vets to gain hands-on experience around horses. This helps not only from a medical perspective but, perhaps more importantly, to get them more competent in being around horses — Jill has had to teach her ‘trainees’ (fully-qualified vets) colours and markings so they can describe their patients, as well as often having to show them how to check heart rate, with some trainees not knowing where the heart is, and how and where to give injections. The first two weeks of the training program also involve being allocated horses to muck out, groom and feed so the trainees gain some general horse knowledge, get more confident being around them and, perhaps for the first time in their lives, experience getting a bit of dirt of under their nails! Jill has also run a farriery apprenticeship program supervised by Gareth McWhinney — a much-needed initiative as there seems to be a real lack of knowledge or thought amongst Egyptian ‘farriers.’ I have seen every shape of hoof imaginable — from the longest toes with the lowest heels to the most upright square hoofs and everything in between, including several laminitic horses still forced to work despite their pedal bones protruding through the soles of their hooves. The traditional Egyptian cure for this seems to be to cover the sole with used engine oil and nail a rubber or metal pad on top. These overworked horses have ridiculously long days anyway, but the undue stress and strain put on their legs from poor shoeing is surely putting them through a lot of pain, and it’s no wonder they often trip or fall over. The pace of life for locals here seems fast and aggressive, and the working horses and donkeys seem to be taking the brunt of a frustrated and unempathetic generation, as I found in Luxor and my initial trip to Cairo. Cairo roads were famous in Luxor for being totally chaotic, and I can see why now. 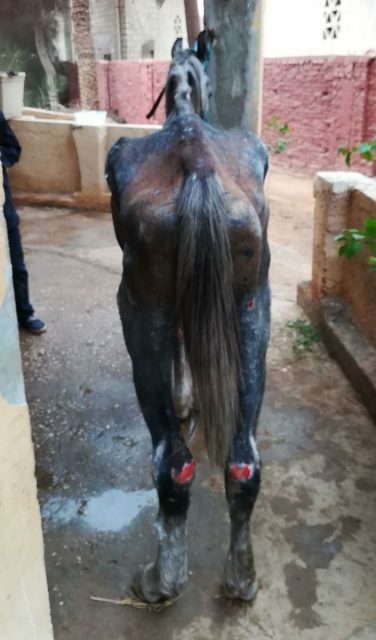 Sadly, but unsurprisingly, it’s very common for horses to get run over in Egypt, and I’ve seen some gruesome wounds caused by traffic accidents. 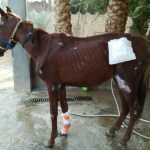 With patience and strict wound management — of which there’s plenty at EEA! — I have been astounded to witness miraculous recoveries of horses brought in with unimaginable injuries. Unfortunately, it’s not uncommon for horses to be left dying in the street after being run over — it’s truly so sickening to think of them already exhausted and abused, to then get run over and be abandoned in agony on the filthy, loud streets. Appallingly skinny and covered in wounds, this patient was found abandoned to his fate in the street. 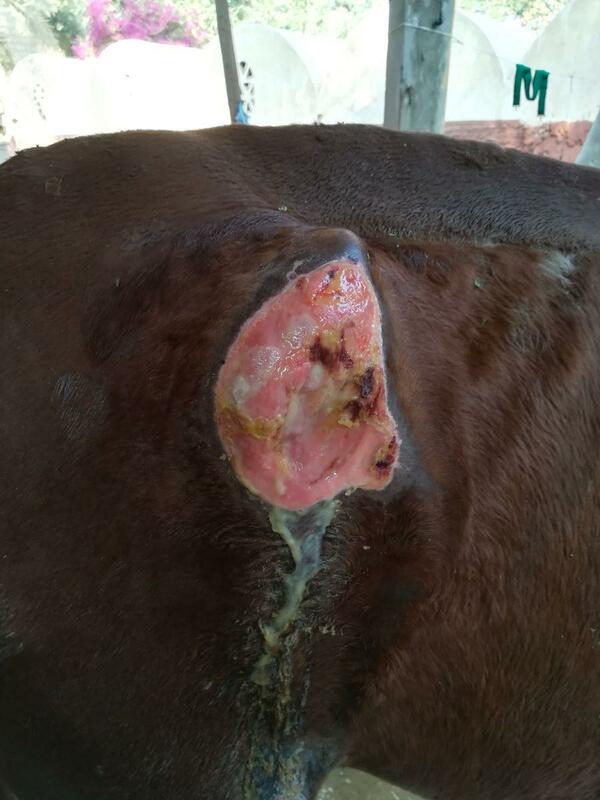 I’ve also seen some disgustingly deep pressure wounds on the hips of horses here. Once a horse gets too old or ill to work at maximum pace, they get sold very cheaply. Only very poor people can then afford to buy them, with very limited resources and money to look after them, but their reliance on them is huge so they are worked harder, getting slower and more sick and sold for cheaper and cheaper. This vicious cycle continues until the poor horses are too ill to stand, so they are then left collapsed on the concrete, their skeletal frames offering no protection or cushioning from the hard ground and their protruding hip bones taking the brunt of their weight. Pressure wounds on hips caused from lying on the concrete. 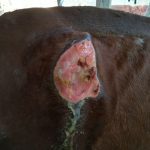 Left untreated, these gaping wounds can become a breeding ground for infections. But with the quick and dedicated action of the EEA team, this patient was treated, patched up, and given the best possible chance of healing, in the circumstances. In what is starting to feel like a hopeless and impossible situation, Jill’s perseverance, unyielding high standards and relentless determination are really inspiring. The training programs at EEA seem revolutionary, and providing locals with skills that not only improve their own lives but will have a much wider impact on equine welfare in the community is beneficial on so many levels. It sounds like Jill has big plans for developing these schemes and many more in the future — she’s currently supervising a barley grass growing project and mentioned the idea of a harness making/fitting/adjusting workshop involving local women. I have often felt during this trip that these destitute horses are at the end of a very long line of problems and questioned how we can have a long-term and bigger-picture impact that gets to the root of the issues to try and break the cycle of abuse. Every day I’m delving deeper into the complex puzzle of animal cruelty here and the line between neglect and ignorance is getting very blurred. My heart is getting broken over and over again looking into the eyes of the most dejected, despondent horses and through the anger and frustration I am trying to find some understanding and some hope that if charities like ACE and EEA continue to be supported we could in the future have better lives for working equids and their owners.